And I mean let's talk about ALL of it -- the good, the bad and the ugly. With the recent push of the Obama administration to establish new immigration policy, there has been much chatter. 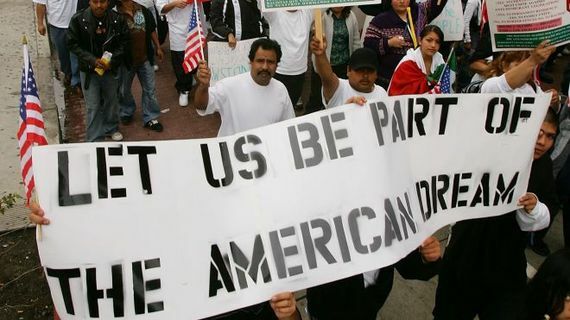 Is it fair to legalize illegal aliens? Why don't they just follow the law? After all it's just a matter of applying. I cringed as I perused all the opinions shared in articles and on social media. I acknowledged that each question was valid but I couldn't help and realize that they were leaning towards the wrong conclusion, completely ignoring the actual plight of immigrants whether legal or undocumented, and snubbing our humanity. Unbeknownst to many, the U.S. immigration system can be a nightmare. It's costly, intimidating and the legal process is no guarantee of residency. What's also missed is that there are various immigration statuses. You can enter the U.S. as a student, as a fiancé, as an exchange student and even as a spouse. And trust me, that's not all! There are others, including refugee and entrepreneur. Each status is an island, accompanied by its own set of limitations as dictated by the government, and transition from one status to another requires meticulously completed paperwork, fees and waiting periods. It's challenging to say the least. But I'm not here to bore you with the details. I'm here to start a paradigm shift. You see, as an immigrant myself, I have been privy to many first-hand accounts of friends and colleagues who have faced the immigration dilemma. The majority of them have been successful but not without their fair share of fear, hassle and expense. Take for instance my friend, Jimmy, who immigrated to the U.S. from Mexico at the young age of 10 years old to be reunited with his dad and escape poverty. He was an undocumented immigrant but he is now a citizen, married to a beautiful wife and father of an adorable son. However, it took him four years and over $4,000 to receive that status. There's also my good friend, Dexter, who moved here from England. He initially entered the country as a student on a basketball scholarship, but he is now a permanent resident via marriage to his lovely wife. Yet to attain his green card, he and his wife had to travel states away to prove they were in fact married. And me? Well, I am a student hailing from Barbados, pursuing my education and an entrepreneur of a local fashion company. I've obtained my high school diploma and Bachelor's degree here but at each level of study, I had to prove I could pay for my entire education with no help. Yes, I said it. We are humans. We are not aliens. We are not thieves. We are not criminals and we most certainly are not lazy. We are not all from Mexico, Asia or Africa. We are citizens of the globe. Despite popular opinion, we are not here to pillage and plunder, and we are not any less of a mortal because we may originate from what are labeled third-world countries. We do pay taxes -- actually over $10.6 billion (CNN Money, 2012). We do contribute to social security -- about $100 billion over the last decade (CNN Money, 2012). And guess what? We don't intend to collect on any of that because the law says we can't. We are hard-working families. We are consumers and entrepreneurs, contributing to the economy every single day. We are not invested in the idea of entitlement. We believe that citizenship is a privilege. Most of all, we aren't petitioning for pity. We agree that the system is broken. We simply seek opportunity -- the opportunity to succeed, the opportunity to pursue our dreams, the opportunity to provide for our families, the opportunity to contribute. So as you continue to find the answers for immigration reform, always remember that we are human and, as Franklin D. Roosevelt said, all of us are descended from immigrants and revolutionists.